Dean’s original brown plaid shirt was never recovered from the shapeshifter in S1, so it’s ironic that he debuts his second brown plaid shirt for the shapeshifter episode in S2. This shirt is a nice brown medium plaid. Unlike most of Dean’s shirts, it does up with snaps, not buttons. Dean first wears it in Nightshifter (2x12), for the entire time he is in the bank (when he first arrives at the bank, he is wearing it underneath his security uniform). In Death Takes a Holiday (4x15), Dean wears it only briefly in the very first Winchester scene when Sam tells him about the case and then makes him get his burger to go. In Changing Channels (5x08), Dean wears it during the opening theme song when he and Sam are riding bikes in the park. In The Song Remains The Same (5x13), Dean changes into it after Michael sends Sam and him back to 2010. In We Need to Talk about Kevin (8x01), Dean must have found this shirt in some stuff they were storing either at Rufus’ cabin or someplace else, because is wearing it when Sam arrives at the cabin and find out that Dean is alive. He wears it for the first evening they are together, but has changed the next morning when they leave for Wisconsin. In Hunteri Heroici (8x08), Dean wears this shirt after the cake explodes at the retirement home until after the fight with at the bank. 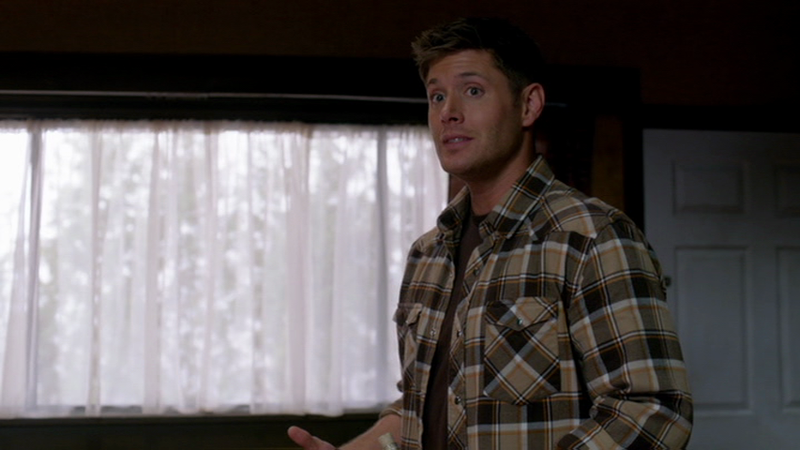 In Man’s Best Friend with Benefits (8x15), Dean wears this shirt to James’ house when they go to try to help him. He changes out of it after Portia stops their attempt at killing James. In Taxi Driver (8x19), Dean is wearing this shirt when Benny arrives and Dean asks him to help rescue Sam. He wears it until the end of the episode. In Dog Dean Afternoon (9x05), Dean wears this shirt at the beginning of the episode when they’re in the Bunker, and then again when they’re researching at the motel after having visited the vegan bakery. 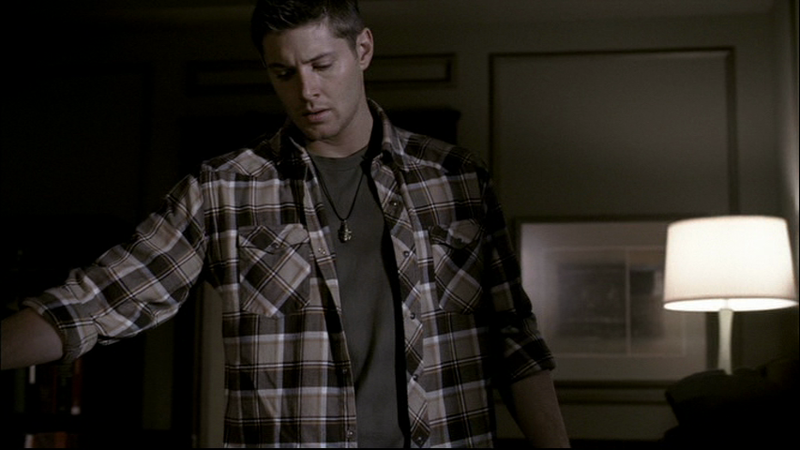 In Rock and a Hard Place (9x08), Dean doesn’t wear this shirt, but we can see him “folding” it and packing it away at the end of the episode, as he and Sam prepare to leave the motel room. In Blade Runners (9x16), Dean wears this shirt from when they are researching who of the Men of Letters may still be alive until end of the episode. In Beyond the Mat (11x15), we see this shirt packed away in Dean’s duffle bag at the beginning of the episode, when Sam glances at the duffle and realizes that Dean intends for them to go somewhere. Any idea on the brand of this shirt? Sadly, no, if it's not already listed, then chances are I don't have it in my notes.